The straddle is one of the most effective binary trading strategies. As the name suggests straddling an asset refers to placing trades in order to cover both sides at once. It requires both CALL and PUT options to be purchased. 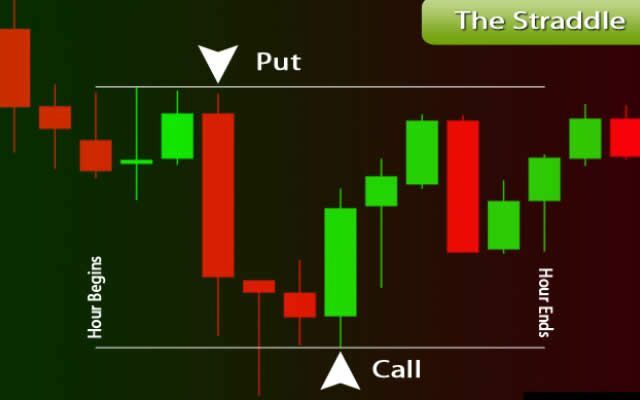 This is one of the main reasons that the straddle is often confused with hedging, which also calls for the purchase of CALL and PUT options. The main difference between straddling and hedging strategies is that in the case of straddling the two conflicting options are not placed at the same time or even close together, but rather they are placed at the respective top and bottom of the trend being monitored. The above screenshot is a perfect example of a straddle strategy being deployed efficiently and profitably. As can be seen the uptrend reaches an unsustainable point, this is confirmed by the Relative Strength Index reading at the bottom, which when above 70 is a good indication that the asset in question (in this case the GBP/USD currency pair) is overbought and ripe for a reversal. The trader places a 20 minute PUT trade at the height of the trend and just as the RSI suggests it begins to drop shortly thereafter. However, the market reacts more aggressively than expected and the currency pair falls rapidly, the drop taking place well within the 15 minutes remaining before the expiration of the trade. In fact it reaches a low point 15 minutes before it is due to expire, inspiring some fear that it may bounce back up before the initial PUT trade expires and thus end out of the money. At just before 2P.M the RSI falls to below 30, indicating that the currency pair is now oversold and very likely to reverse again. 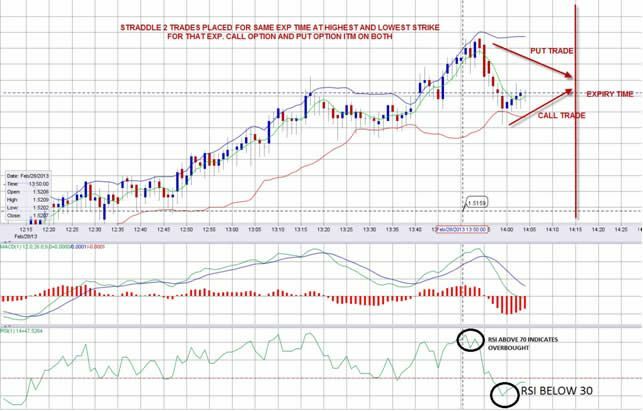 The trader then purchases a CALL trade as soon as GBP/USD drops to below 30 RSI and again it quickly bounces back up. The trade expires with GBP/USD being somewhere between both the PUT and CALL options. As a result both trades close in the money. As you can see straddling can be a very useful tool to capitalise on particularly volatile markets and also to cushion potential losses on a trade that is looking like it may be expiring out of the money. The downside of the straddle is that it only becomes useful in certain very specific situations that are not as forthcoming in times of low volatility. It is also risky in that unlike the above example it is also possible for both trades to expire out of the money.